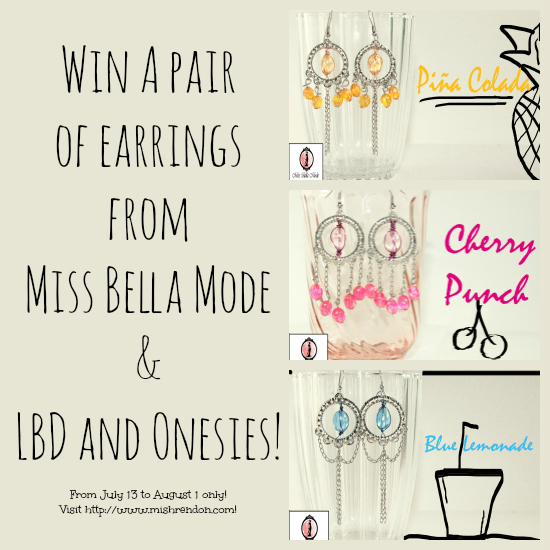 LBD & ONESIES - A Lifestyle Blog: Miss Bella Mode Giveaway! Inspired by French designs, chandeliers and beverages, with a burst of lively colors. The centerpiece is designed to look like a cracked bead or a preserved stone. Each of them is paired with chain designs that adds that distinct “taste”. This is open for Philippine residents only! The giveaway will run from July 13 till August 1. 3. Share the giveaway poster! I would like to win 1 pair from the Cocktail Collection. I would love to win the Fallen Angel from the Shine Bright Collection or the Wine from the cocktail collection. I love the "Wine" from Cocktail Collection and "Avalanche" from Shine Bright Collection :) hope to win either of the two! The earrings are lovely ... and I hope to have it ..